As citizens deeply concerned about the ongoing violence in Burma, we call on you to press the Burmese President to urgently protect the Rohingya using all means necessary, and grant them citizenship and full legal rights when you meet with him this month. We urge you to insist he implement such measures and tackle the impunity of aggressors to stop the violence as a condition of improved trading relations. You have both spoken repeatedly about the need for early action to prevent genocide and crimes against humanity -- now is the time to live up to those words. Most people didn't know who the Rwandans were until it was too late, and 800,000 of them were dead. 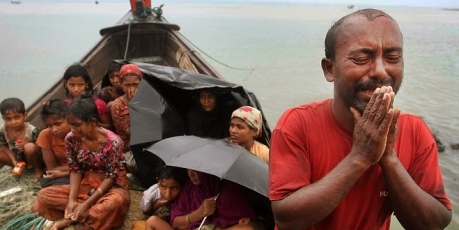 Right now, the fate of Burma's Rohingya people is hanging by a thread. Racist thugs have distributed leaflets threatening to wipe out this small Burmese minority. Already children have been hacked to death and unspeakable murders committed. All signs are pointing to a coming horror, unless we act. Genocides happen because we don't get concerned enough until the crime is committed. The Rohingya are a peaceful and very poor people. They're hated because their skin is darker and the majority fear they’re 'taking jobs away'. There are 800,000 of them, and they could be gone if we don't act. We've failed too many peoples, let's not fail the Rohingya. Burmese President Thein Sein has the power, personnel and resources to protect the Rohingya, all he has to do is give the word to make it happen. In days, he’ll arrive in Europe to sell his country’s new openness to trade. If EU leaders greet him with a strong request to protect the Rohingya, he’s likely to do it. Let’s get 1 million voices and plaster images of what’s happening in Burma outside his meetings with key EU heads of state.